With the tesa filter consultant you can easily select your printer model and then not only get the right filter for your device, but in addition also an animated assembly instructions. that laser printers emit particulate matter. That’s why the air quality in some offices is worse than the air in the immediate area of a freeway with average traffic levels. 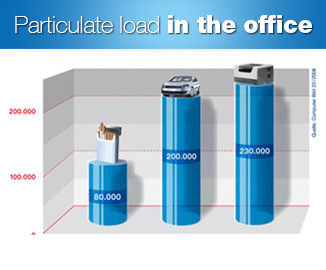 Every day, employees at offices in Germany inhale large quantities of particulate matter emitted by laser printers. When they do so, they may be jeopardizing their long-term health. The tesa Clean Air® fine dust particle filter creates a clean working environment. the more easily they can penetrate to the lungs – and therefore, the more hazardous they can be. 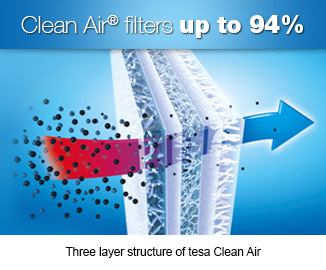 tesa Clean Air® guarantees maximum filter performance up to 94%. The new particulate filter consists of environmentally compatible, completely recyclable nonwoven fabrics. Thanks to its three-layer structure and the electrostatically charged microfibers in the middle layer, even the smallest particles, which can enter the lungs, are permanently absorbed – regardless of the specific chemical composition of the particulates emitted. 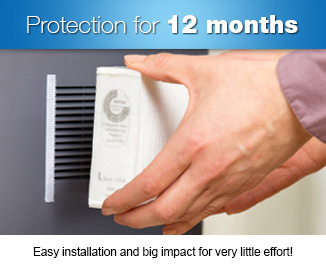 with self-adhesive hook-and-loop tape makes tesa Clean Air® easy to use. The filter delivers a big impact for very little effort. The filter offers protection for about 70,000 printed pages, or twelve months. When you change the filter, the hook-and-loop strips remain attached to the exterior of the printer. Attach the new tesa Clean Air® to the strips on the laser printer and press into place briefly and firmly.